In some ways this feels like a very traditional epic fantasy, it has elves and goblins in it, it is set in an empire with an ancient history and its main character is a young man plucked from obscurity to play a crucial role in the fate of the empire. In other ways, this is less traditional, there’s no dark lord to overthrow, no epic quest and no pitched battles between good and evil. There’s enough here to inspire some nostalgia for the epic fantasies I used to read when I was a teenager but in many ways this is a more interesting story. The book starts with the protagonist Maia being woken in the middle of the night by a courier sent to tell him that his father and half-brothers have been killed in an airship accident. Since his father was the Emperor and his elder brothers were his father’s heirs this means that Maia is suddenly thrust into the position of being the next ruler of the Empire of the Elves. As the book’s title alludes to, this is something that many of his new subjects find controversial since Maia is half-breed, his late mother having been a goblin who married the Emperor in a short-lived and unhappy political marriage. Maia has grown up in obscurity, effectively in exile in a distant part of the Empire under the care of his often cruel cousin and warder, and with no contact with his father or other living family. There is a huge amount of culture shock as he suddenly finds himself in the capital living at the Royal Court where he knows no-one and where he knows little of the workings of the Empire. As the book goes on Maia must deal with the various challenges of the situation, ranging from challenges to his rule from ambitious nobles to more personal challenges as he has to find a way to be happy in his new role. He is a young man with trouble making friends when there is an inevitable separation from his subjects and it is difficult to tell friend from foe. Although there are a number of interesting plot points, including a couple of conspiracies against Maia’s rule and the investigation into the airship disaster that brought him to the throne, I wouldn’t say this is a particularly plot-driven book. Instead, the main attraction here is the characterisation and the setting. I found Maia to be a very compelling character, it’s very easy to like him and sympathise with some of the troubles he encounters. If I had a criticism it would be that occasionally his actions seem a bit too selfless (he tends to be a bit too forgiving to some of his enemies, for example), but he is an interesting character and gets some good character development as he learns how to adapt himself to the new role he finds himself in. The supporting characters are also interesting with some good subtle characterisation where sometimes it is important to pay more attention to character’s actions than what Maia thinks of them since, at least at first, he isn’t always the best judge of character, and being the Emperor people will tend to tell him things they think he wants to hear rather than what they necessarily think themselves. It’s also possible to see how the perceptions of other characters towards their Emperor changes as the book goes on, many of the characters seeming to have judged him based on what he was or what they have heard of him, and as they get to know him better their opinions of them change in a variety of ways. There may be a small number of brief action scenes but for the most the part plot advancement is done via dialogue as Maia tries to navigate the convoluted world of court intrigue. Despite the lack of the type of action traditionally seen in epic fantasy stories there do manage to be some tense scenes as Maia’s grasp on power can start to seem fairly tenuous as the book goes on. I think it manages to be a compelling story although the finale to one particular plot thread does fall a bit flat and it does feel like the novel ends slightly abruptly (although on a fairly appropriate note). I thought the writing was very good. The dialogue may not be to everyone’s tastes since it uses a lot of deliberately archaic and formal-sounding language but I thought it felt very appropriate to the setting. 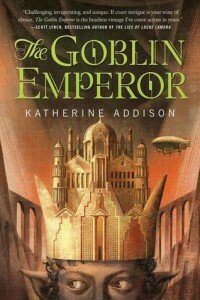 The world-building manages to suggest a lot of depth and a long history without getting bogged down in too much exposition, where it makes sense there is some exposition as other characters explain things to Maia he doesn’t know but other elements that he would already be familiar with, such as the Empire’s religion can be picked up from the brief mentions of them. Sometimes the plethora of titles and foreign terms and the large number of named characters can start to seem a little bit overwhelming but for the most part I didn’t find it too confusing. Overall, I’d say this was an Epic Fantasy novel that in many ways wasn’t particularly epic but that didn’t stop it being compelling. I don’t know if the book will be to everyone’s tastes but I found it very enjoyable. As far as I know there isn’t a sequel planned, but I’d happily read one if it was written.